Got this one while fighting LK, appeared during some damn freezes tho, so could be a false one. No, there is no other mean than the debug level to produce some output. Thanks for your reports, I will have a look into them. Thanks for picking up this addon for Patch 4. I've been using ArcHUD (1 & 2) almost since the launch of WoW, I would be lost without it. I'll give some input for ticketing as best I can. I have an issue which I'm finding hard to reproduce - 3D models for players are sometimes reappearing when a target is not selected, I tried looking at the commands for debugs you gave further below but its not giving anything to reflect this issue. Once I manage to narrow down the specifics I'll open a ticket. Are there any other console commands I could use to generate a more detailed event output? Version 0.9 is on the road and all features planned for it are available in the current beta build. ArcHUD3 is now also available via curse.com and the curse client, which should facilitate updateing a lot (in the client, you can choose what kind of version you would like to install - release/beta/alpha). Thanks nyyr! This is working great! Great job!! I've used this addon for years! None of the other HUDs come close to the functionality and elegance of ArcHUD. Nyyr, HATS OFF TO YOU! Now I can't wait to see what the future holds for this project! a very big thank you from me here as well. great work. First off... THANK YOU for reviving this! I do have one thing to report. I used to use ArcHud2 to mouseover the buffs/debuffs my target has, however I can no longer do this. No tooltip is shown. I hope you can work this out! Btw - if you have a PayPal, I'll gladly contribute a few bucks your way. Please also use the ticket system - it helps a lot to keeping track of feature requests/bugs. Any plans to change the CP display back to an arc next to the mana/energy bar? I'm not a huge fan or staring at a number while DPSing. Thanks for the work on it so far, much more lightweight than IceHud! Ring-specific settings are in the respective rings' file. Works like a charm, loads of options that were available in ArcHUD2 are gone, but somehow I don't miss them at all. Works awesome just as it is. Back to testing! I believe the fatigue cast bar used to be included in your cast bar. Just another difference i've noticed. thanks a bunch for picking up this project and investing all the time in it now. Was staring at the various icehud/metahud alternatives with discomfort and sadness right after the patch. With r8 error messages upon death were gone too. Maybe you are planning this anyway, but just in case you dont: I always used only the arcs in archud - no numbers or text whatsoever. 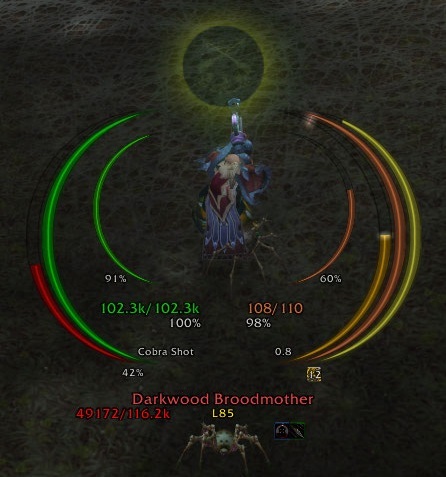 Would it be possible to hide the health/mana text in the lower center of the hud? I couldnt find a corresponding option in the core.lua. Regarding Evangalism: I was thinking about this, but, yes, since it is a buff, you should use PowerAuras instead. If I add something like this then it will be configurable for any buff - but only for one which is the next issue ;) Anyways, this won't come for the first release where I'm currently heading to. Regarding the gap: This is intentional, but I probably will change the default. The position of the arcs will be configurable soon. Graphical issue: The life bar of your target is up against your life bar, which seems to be correct. However on the contrary, the mana "Arch" for when you target a player is not up against your mana bar. Seems like there's a gap between the arches when there shouldn't be one. You might be planning to add functionality of another arch and we just don't know about it; just wanted to point that out, just in case it was unintentional. If possible, it'd be great to add the new disc priests Evangalism to the same spot where Holy Power is going. I know evangalism is a "Buff" unlike Holy Power or Combo Points, but it's very similar in effect and would be very useful for Disc Priests. Thanks so much for updating this, i was completely lost w/o this addon.